If it is confirmed a ballistic missile has been launched over Japan the government will use the national system of instant warning called “J-Alert” to transmit emergency information. By using the system “J-Alert” a special alarm along with a message through the emergency transmission system will be issued and an emergency message will be also send to cell phones. 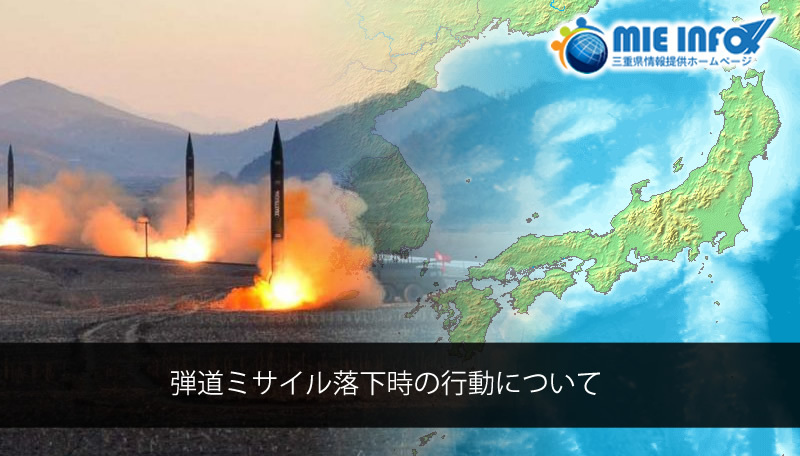 Why sometimes the “J-Alert” system does not activate even if a ballistic missile is launched? The “J-Alert” is used if there is the possibility of a ballistic missile falls over Japan’s territory or sea or if there is the possibility a missile flies over the country. Therefore, if it is decided there is no possibility the missile falls over Japan’ territory, sea or flies over the country, the J-Alert will not be issued. *It is prohibited to replicate the sound or record and reproduce it illegally. “If the “J-Alert” activates, be calm and act immediately. In the case you are in another place other than your home: go to resistant-structure buildings or underground (commercial centers underground, subway stations, among others). In the case there are no buildings: go to covered places or get down and protect your head. In the case you are inside a house: keep away from windows or go to the room with no windows. Seek accurate information as fast as possible. Focus on collect information through television, radio, Internet and others. In the case there are orders from the government, be calm and act according to the instructions. In the case you are outdoors: Cover your nose with a cloth, keep away from the place and go to tall and sealed buildings or follow wind direction. In the case you are indoors: Turn the exhaust fans off, close the windows, seal the gaps and seal the rooms.